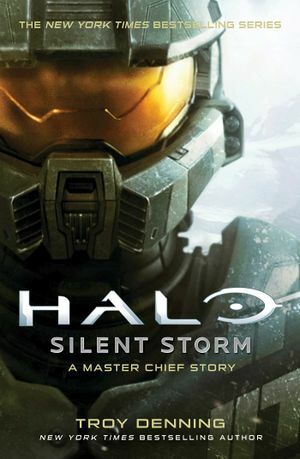 Halo: Silent Storm - A Master Chief Story is a print novel by Troy Denning, released on September 4, 2018. Silent Storm has narrative connections to Halo: Collateral Damage, a three-part comic book series from Dark Horse written by Alex Irvine. “ 2526. It has been almost a year since humanity engaged in its destructive first contact with a theocratic military alliance of alien races known as the Covenant. Now the hostilities have led to open war, and the United Nations Space Command understands virtually nothing about its new enemy. There are only two certainties—the Covenant is determined to eradicate humanity, and they have the superior technology to do just that. The UNSC's only hope lies with the Spartans: enhanced super-soldiers trained from childhood via a clandestine black-ops project to be living weapons. Their designated commander, Petty Officer John-117, has been assigned to lead the Spartans on a desperate counterattack designed to rock the Covenant back on its heels, and to buy humanity the time it needs to gather intelligence and prepare its defenses. The novel's cover is illustrated by artist Christian McGrath, who has done book covers for many New York Times Best selling authors. Steve Downes read an excerpt from Silent Storm's first chapter to promote the book. Several details and characters in the novel, originally planned to be included by Troy Denning, were changed at 343 Industries' request. For one, Denning originally planned to include twenty Spartan-IIs, but was told by 343 Industries to reduce their number, resulting in a squad of twelve Spartans in the final novel. Likewise, General Harper Garvin's role was originally to be filled by Howard Graves, originally featured in Halo: Ghosts of Onyx. Finally, Denning's early drafts envisioned Castor's Jiralhanae companion as Atriox rather than Orsun, as Halo: Retribution had suggested the two had served together in the Bloodstars during the war.